"Three generations ago, The Empire was overrun. The Last Outpost, a small coastal trading community located deep in the wild, was spared from most of the fighting and survived. Life in the Outpost is not easy, and many of the finer things from the old Empire are absent. The residents of the Outpost are descended from the survivors of The Fall, a tough and adventurous breed. They are well suited to the task of reclaiming the land once tamed by their forefathers." 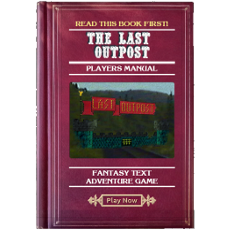 The Last Outpost has a large unique world, player elected clan membership, player regulated pvp, and a hands-off policy for gods. It is a mix of traditional hack-and-slash game play and quest driven exploration. The game accepts both IPv4 and IPv6 connections, and has a built in shell-like CLI with arrow history, hotkeys, and tab completion. Connections made through the last-outpost web page are SSL encrypted for privacy. Additional mud client software is not required to play the game, but is supported.